I caught this movie, I believe, August of ’83 or ’84 on cable. Can’t rightly remember now, but I know it was a month before I started the new year in high school, either as a freshman or a sophomore. That’s pretty much it for a memory. It goes without saying I loved the movie upon first viewing, and its most distinct feature is it’s retro style. This flick actually might fit into my self-made label, “ret-mod” (short for retro-modern noir), I created for movies like this. It Follows (2014) and Insectula (2015), which I also reviewed, are ret-mod flicks. A good ret-mod flick is hard to pin down when it comes to year. It Follows and Insectula exhibit signs of modern tech within the films, but the actual cinematography is done in such a way to give them “back in the day” vibes. It Follows looks a lot like a movie John Carpenter directed in the early 80s, and Insectula looks a hell of a lot like a flick right out of the 60s. 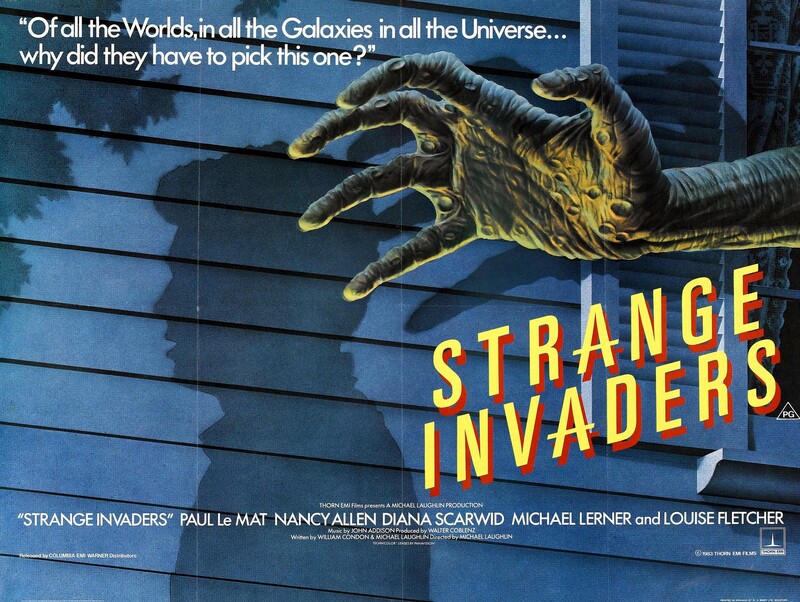 Strange Invaders, even though it was filmed in 1983 and is set in 1983, feels, however, like something ode to 50s science fiction, even in pacing and at times with the music. I conclude then Strange Invaders to be full on ret-mod. For those who’ve never heard of this movie, as you can clearly tell by the title alone, we’re dealing with aliens here, and not necessarily the evil kind. On the other hand they’re not very congenial to the humans they encounter in the flick either. This isn’t an invasion, though. It’s more a scientific away mission to study the human condition. 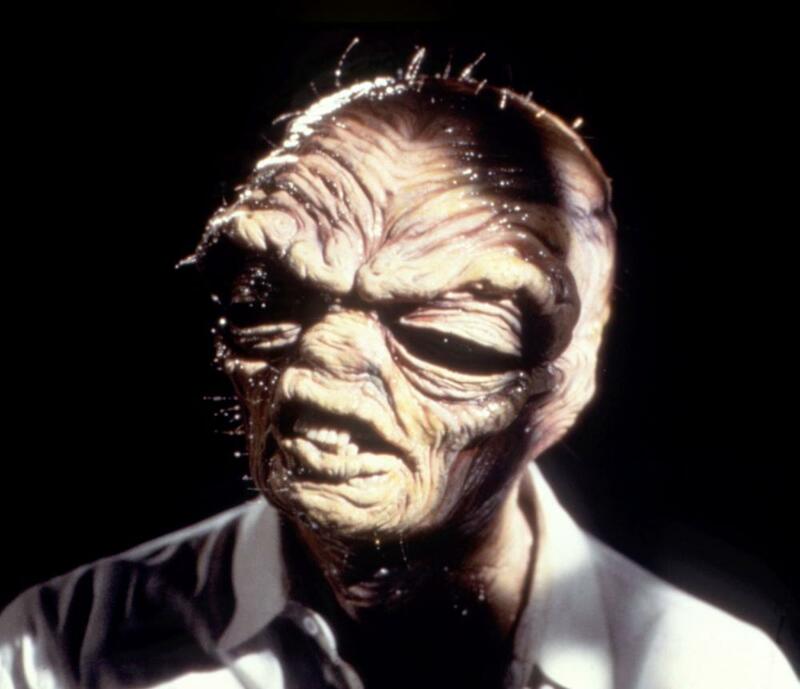 In 1958 a species of humanoid alien life came to the earth and took over a town in the Midwest called, Centerville. To their credit they didn’t kill any of the residents, they simply balled them up into a ghostly light anomalies and stored them in their new base deep under the local church. They then fitted themselves with ultra-realistic human looking skin suits and inhabited the town, all in an effort to study and understand us. The government knew all about their arrival, put out the story Centerville was destroyed by a tornado, and made a pact with them to leave them alone while they conducted their “study” in return for some favors. 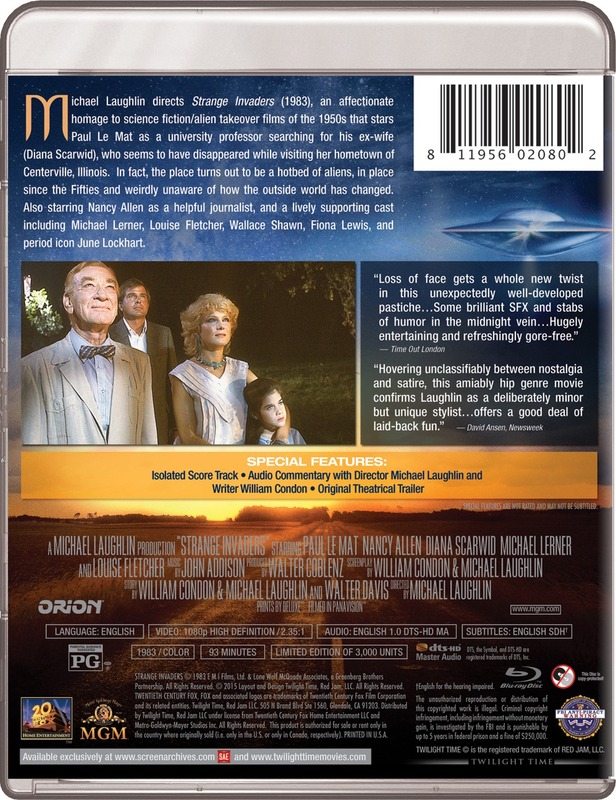 These favors are never specified and our representation of the government in this flick comes in the form of Mrs. Benjamin (Louise Fletcher), who heads up a UFO center in the heart of New York. This mission of theirs has a termination date: 25 years seems to be it, and that date is coming fast since we pick up this tale in the year 1983. There’s one thing these aliens never considered, however, that some of their members might actually like living as a human. 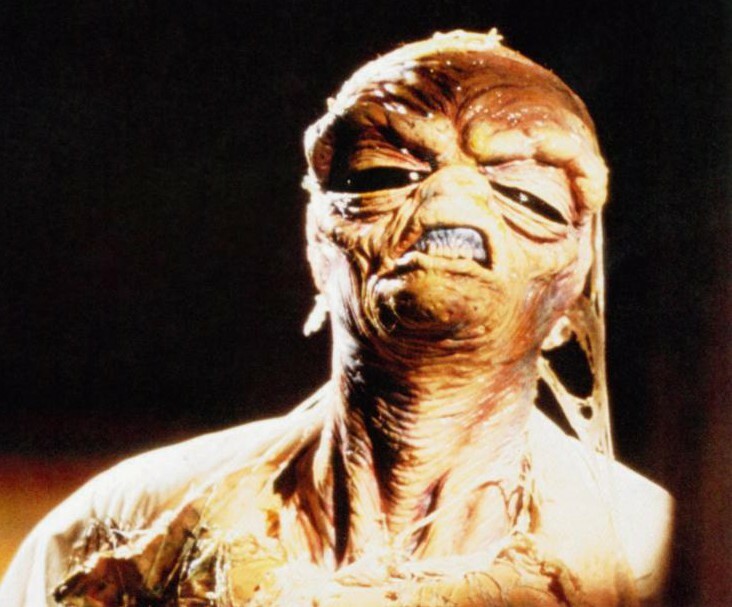 This happened to one of them, a Margaret Newman (her assumed human identity) (Diane Scarwid), she also found a human to settle down with, a Professor Charles Bigelow (Paul Le Mat), and to even have a kid with, Elizabeth Bigelow (Lulu Sylbert), but once the other “team members” learned of this human-alien hybrid, they deem it to be valuable and thus worthy of taking back to their home world. Margaret has no intentions of seeing that happen. Sure, she’ll return, if she’s made to and, yes, she’s made to in the final act, but Liz, for all intents and purposes knows no other home than Earth and her mother intends to keep it that way. This means hiding their child, which she does by dropping her off at Charle’s apartment and making up the story she has to go home to Centerville to attend her mother’s funeral. Charles has and never had any idea his ex-wife was an alien, so he simply agrees to take Liz and watch her until she comes back, but a week later, she doesn’t come back and he can’t get any word to this Centerville, Illinois. Apparently, he never knew this town was supposed to be wiped off the map by a natural disaster. With no other recourse at hand he decides to make a personal visit to Centerville and drops Liz off at his mother’s house. She’s played by Lost In Space’s (1965-1968) June Lockhart. Centerville circa 1983 is a very strange place, it’s stuck in time, predictably in 1958, and the residents aren’t very friendly towards Bigelow. Kenneth Tobey (The Thing From Another World, The Howling) has a cameo as the head of this alien science team, Arthur Newman. Same last name as Bigelow’s ex-wife but he claims to not know who Margaret is. These aliens don’t like dogs either, for after Bigelow rents a room from Newman and goes out to get the lay of the land leaving his dog in the room, Newman pays the animal a visit and balls it up into one of them light anomalies. 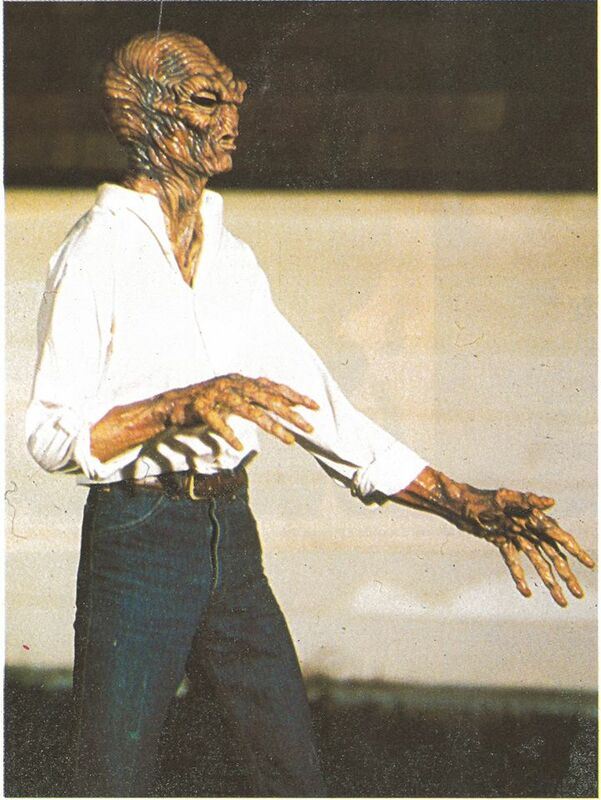 Eventually, Bigelow is chased out of town by the residents, narrowly escaping being balled up himself, but on his way he nearly runs over one of the aliens in their natural form. Back home in New York we’re finally introduced to government agent, Benjamin, who’s lying when she tells him she knows nothing of any aliens in Centerville, and to our heroine, tabloid magazine reporter, Betty Walker (Robocop’s Nancy Allen). 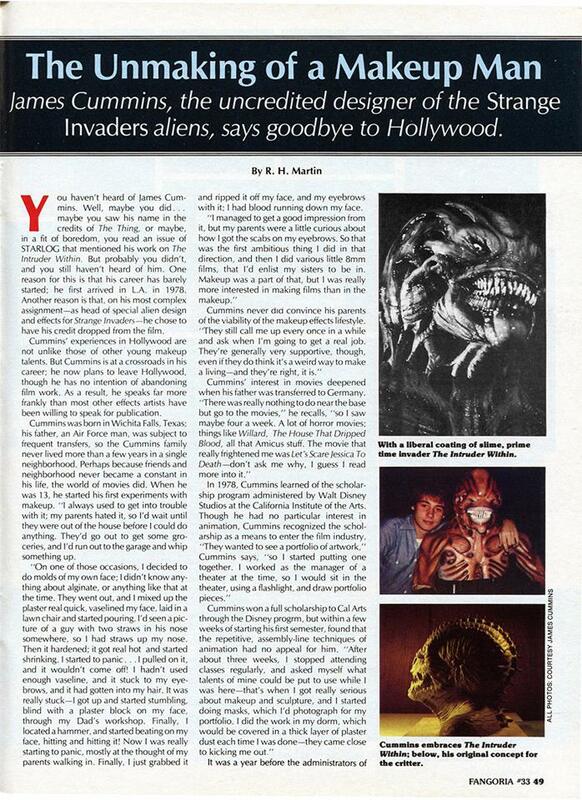 Betty makes up stories for The Informer and one of them was about an alien, and the photo she used was of the kind of alien Bigelow saw in Illinois. This is what prompts him to seek her out and find out where that photo came from. While all this is happening, the aliens are preparing to go home and have come to New York to find little girl, Liz, along the way they tangle with Betty, who manages to shoot one dead, and Bigelow again. Then suddenly Margaret comes back looking for Liz and in so doing decides to finally tell her ex who, or I should say, what, she really is. Our next important player in this alien drama is Willie Collins (Michael Lerner), the creator of that alien photo The Informer ran. He’s a permanent patient in this mental facility because he encountered these aliens before and right in Centerville too, roughly in the same time period they arrived, and spoke to loudly about them to the outside world. They took his two kids and wife, balled them up, but not until the end do we finally learn this “balling up” was not murder. Willie believed it was, though, and has been looking for payback for a long, long time. He joins, Bigelow and Betty on their trek to Centerville and in their evading of Benjamin and her government goons. Back in Centerville it becomes a race against time (doesn’t it always) to rescue Liz from their clutches and get out of town before horrible things happen to them, or Liz. Betty manages to get caught and balled up, so does Willie and it looks like we’re in for a downbeat ending as the mother ship returns and all the aliens of Centerville begin to shed their human skins and board the ship. A decision is made to take all the Bigelows with them, but one last ditch effort by Margaret, using her alien powers of throwing lightening bolt like energies from her fingertips, stops the door of the ship from closing and allowing Charles and Liz to escape. After the ship leaves this is when we finally learn that “balling up” process wasn’t murder. The church doors fly open and out pours all these glowing orbs that reform into the people we all thought were “killed,” and most of them are Centerville residents caught in 1958. Bigelow gets Betty and his dog back and Willie gets his wife and kids back, but Margaret is now off-world. The effects, practical and otherwise, are very well executed for their time period. With the “balling up” process we get to see how that’s done as human flesh and bone are kind of squashed up before becoming an orb. None of this is remotely gory, but a couple of the “balling ups” do come close to horror. 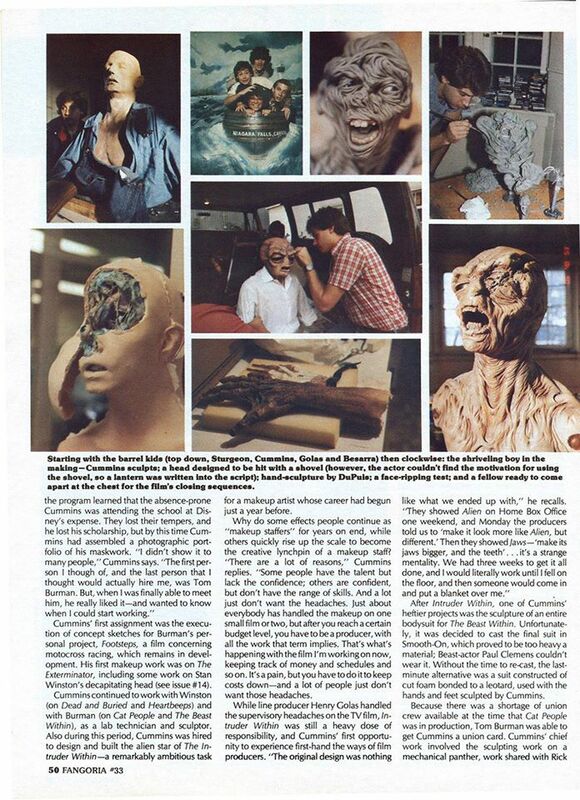 The design and execution of the “bug-eyed aliens” have always been a favorite of mine, and before CGI ever came along, it’s all done with animatronic heads in the scenes where the aliens take off their skin suits. And the cinematography is panavision beautiful! 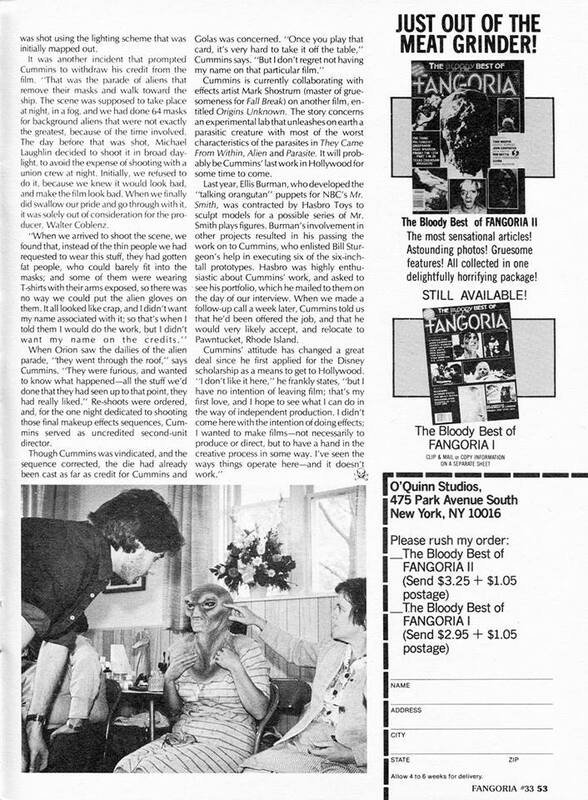 Strange Invaders was released on three previous occasions by MGM. Once in 2001 as a solo edition, once in 2005 as a double feature with the equally cult-loved Invaders From Mars (1986) remake, and one last time in 2011 as part of a four film set with Invaders From Mars again, Invisible Invaders (1959) and Journey To The Seventh Planet (1962). All these releases came under MGM’s Midnite Movies banner. This past October 13th boutique distributor, Twilight Time, finally gave us the much-awaited blu-ray! Video/Audio/Subtitles: 1080p 2.35:1 high definition widescreen—English DTS-HD Master Audio Mono—English subs only. Worth the upgrade! Colors pop and it has very good detail! Limited to only 3,000 units, if you want one get it now! Once they’re gone, they’re gone! You can buy Twilight Times titles at two places only: Screen Archives Entertainment or Twilight Times’ own site. 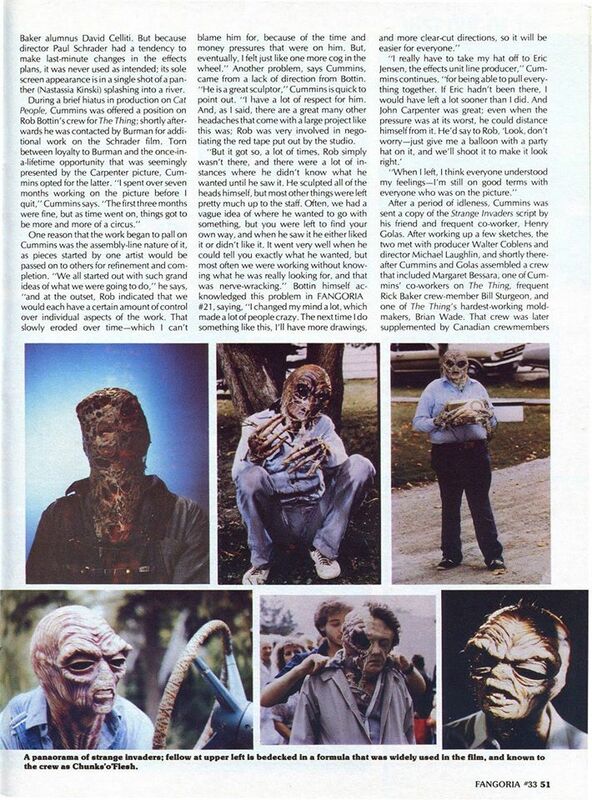 For an added treat here’s an article from Fangoria #33 about the late FX artist James Cummins (1959-2010). Click on the photos to enlarge and read. 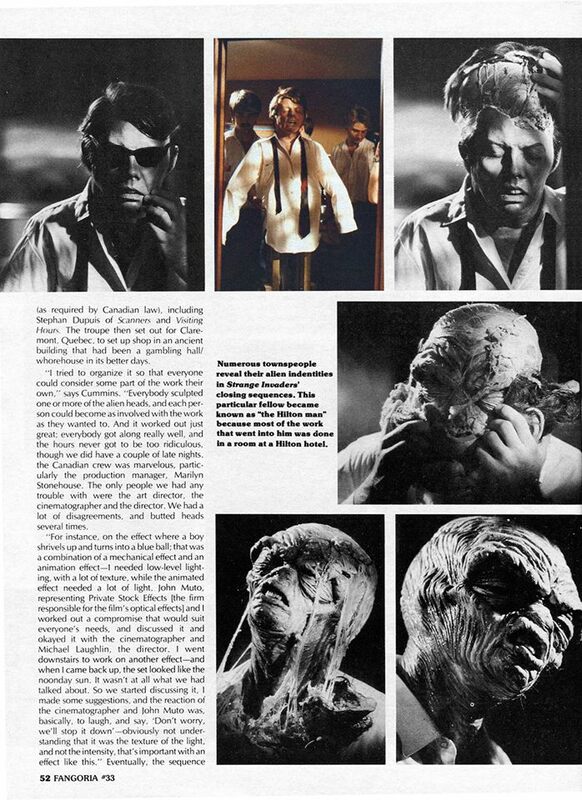 Gallery | This entry was posted in Strange Invaders (1983) Twilight Time Blu-ray. Bookmark the permalink.